Thinking of a vacation? Don’t do the normal holiday again this year but rather get the maps out, load up the car, fill the tank, and hit the highway. Thankfully Delhi offers varied choices fit for different seasons of the year. 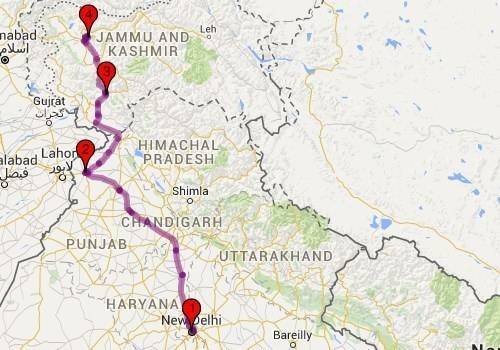 Here are our 6 best road trips from Delhi, worth adding to your itinerary. If you are a person who does roadtrips often, then chances are you probably already done it. Rishikesh needs no introduction for people from NCR. Beach (riverside that is) side tented accommodation, rafting in rough waters of the Ganga, a walk in the hills and unbeatable weather – Rishikesh is as a weekend destination is no-brainer. Delhi- Risihikesh can be done overnight as well, provided you avoid or alert around Muzaffarnagar area. From Rishikesh it is the beyond Mussoorie that should get you interested. Not that Mussoorie is not a nice place. From Mussoorie head to Dhanaulti for a place with awesome Himalayan views and tranquility. Chamba (the one in Uttarakhand), just about 30 KMs from Dhanolti can also be visited from here. Ideal Time: March to November. This is a nice sweet road trip from Delhi to go on with family especially if you have kids and elders. You can have something for everyone in this trip. Temples of Mathura and Vrindavan for parents, Taj Mahal for your beloved and great architecture and may be some wildlife and fun for Kids. Depending on your preference you can choose between Mathura or Bharatpur wildlife sanctuary. Agra and Fatehpur Sikri are a must if you have been there. Gwalior has a grand palace to be seen but check opening times before you visit. Orchha is little known wonder lost in time. 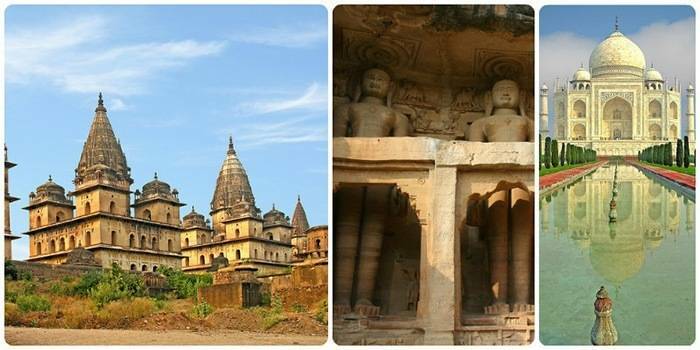 Orchha is a must visit place for people interested in architecture and history. 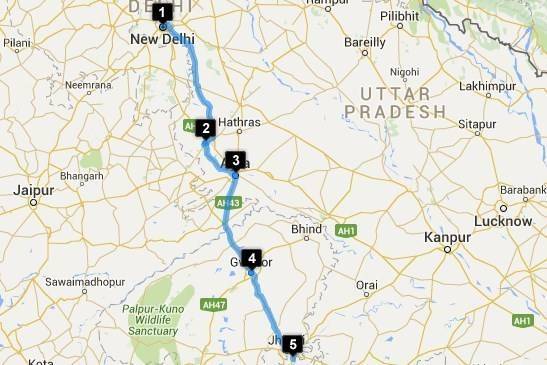 Agra to Gwalior is little over 2 hour ride while Orchha is further 3 hours away. 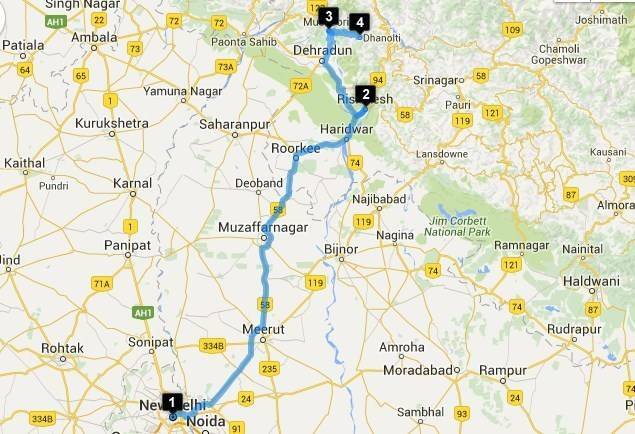 This road trip from Delhi involves a lot of driving and not so many stops is for the people who ‘Live to Drive’! Starting from Delhi, Bikaner can be reached in about 10 hours with a short stop in Jhunjhunu which us famous for its Rajputana havelis. Bikaner’s Junagarh Fort is worth a visit along with Lalgarh Place and not to forget the ‘world famous’ Karni Mata ka Temple with all its rats, is just about 30 km from here. 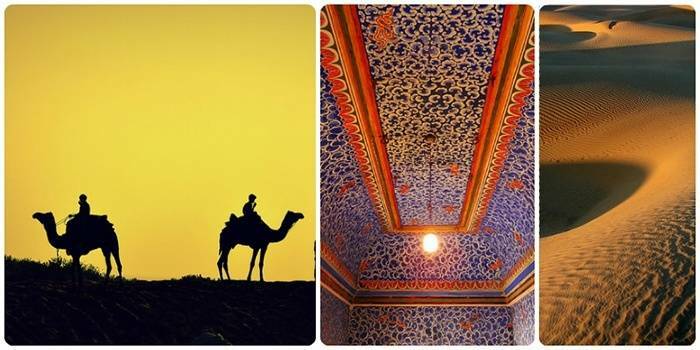 After a day of sightseeing and rest you can take a day’s ride to Jaisalmer. If not going in peak season then you can arrange a Desert Safari and camping right when you reach. Do bargain hard. If visiting in peak season then it’s better to do advance stay arrangements. 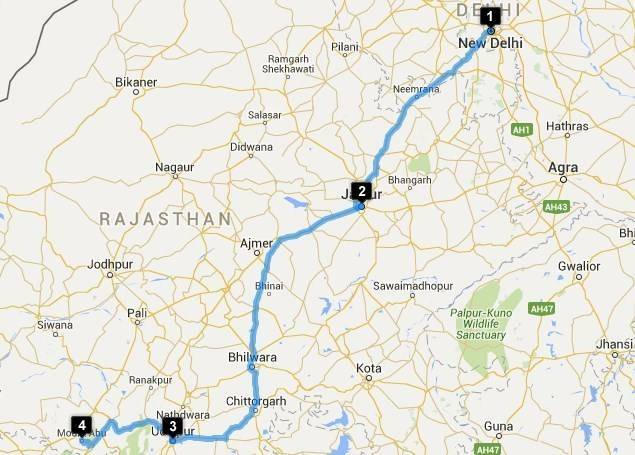 On you way back if you have time you can go via Jodhpur, Ajmer and Jaipur. Start with gateway of Rajasthan – Jaipur. Though it’s a state capital, Jaipur hasn’t lost its royal charm one bit. Stay of a day here to visit the forts, Hawa Mahal and a fine Rajasthani dinner. Road from Delhi to Jaipur is good but has lot of traffic these days so better start early. 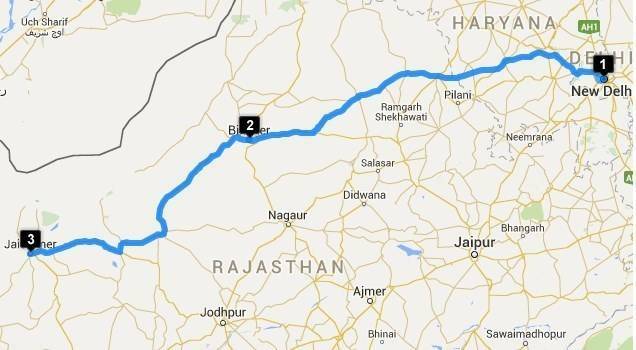 Resume journey with NH-8 which will give you option to visit Ajmer Sharif if you want to, otherwise you can bypass Ajmer and proceed towards Nasirabad; next stop would be Chittorgarh and would be about 5-6 hour ride. Chittorgarh Fort is one huge magnificent fort and with architectural marvels such as Victory towers, Chittorgarh deserves to be visited. From Chittorgarh, Udaipur is just a 2 hour ride. Mount Abu is further 2.5-3 hours ride. 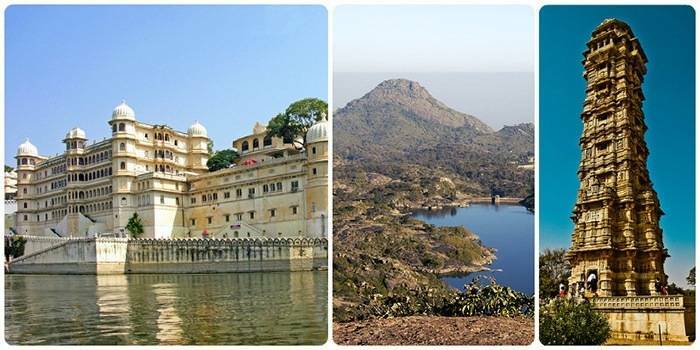 You can give Mount Abu a miss and visit Jodhpur on your way back as well! 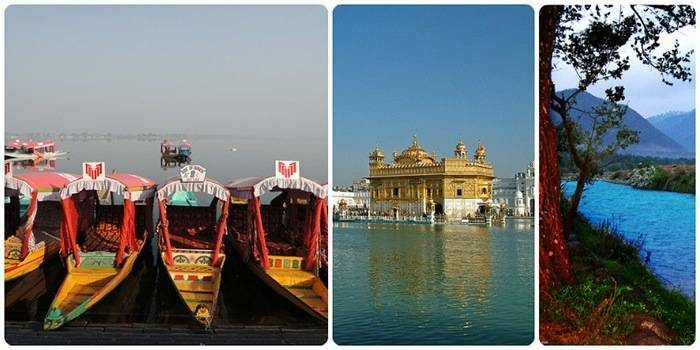 Visit Amritsar for the Golden Temple, Wagah border ceremony and savoring Cholle Bhature. It’s a long drive from Delhi to Amritsar but with roads so good, can be easily done on a day. From Amritsar, your next stop can be Patnitop – better stay in the hills then the plains of Jammu. Patnitop is a small hill-station and from here you can easily reach Srinagar in half a day if you start early. Once in Srinagar, make yourself comfortable in a shikara or a hotel opposite Dal Lake. A day for Srinagar and a day each for Gulmarg or Sonmarg and Pahalgam. If you want to go off the beaten pathin Kashmir then Yusmarg, Kokernag and Martand Sun Temple near Anantnag should be on your list. Well we saved the best for the last, this is the mother of all road-trips. A road trip to Leh, Ladakh needs to be properly planned right from time of the year, vehicle you would drive and preparation for it. 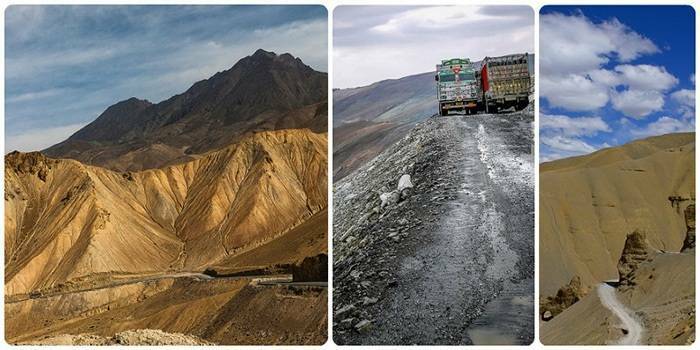 Manali-Leh road opens up from about mid-May to early November. Weather is quite unpredictable these days but still August-September are the safest months to travel. Even during the best of season, you would encounter lot of slush and water crossings so it takes some driving skills to make this trip! But once you have done this trip, you pretty much drive anywhere on planet! 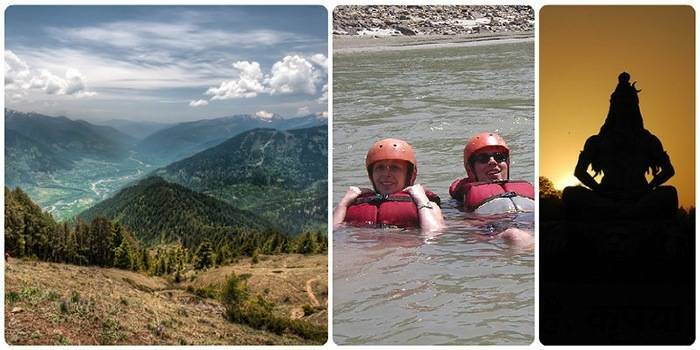 Kullu or Manali can be your first stop which is easily doable in a day from Delhi if you start early. On Manali-Leh you can choose to stay at Keylong, Jispa or Sarchu. You can take a detour and visit Tso Moriri Lake first and then proceed to Leh. 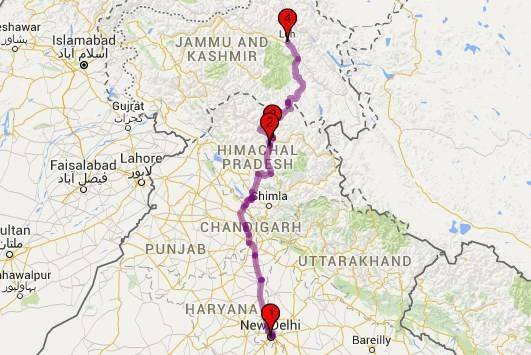 Return via Kargil – Srinagar is also a good option. Ideal Time: mid May to October.